Pillowsham - View our range of Pillowsham here at Anthony Ryans linens shop, offering excellent quality Pillowsham to suit your needs. 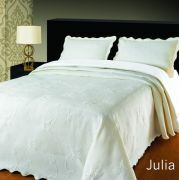 A pillowsham is the finishing touch to your bedding ensemble, matching to your throw or duvet cover. Pillowhsams are just like pillowcases covering your standard pillow size, but have an extra decorative design around the outer edge.